Fife farmer Allan Bowie has been elected the 61st President of NFU Scotland. 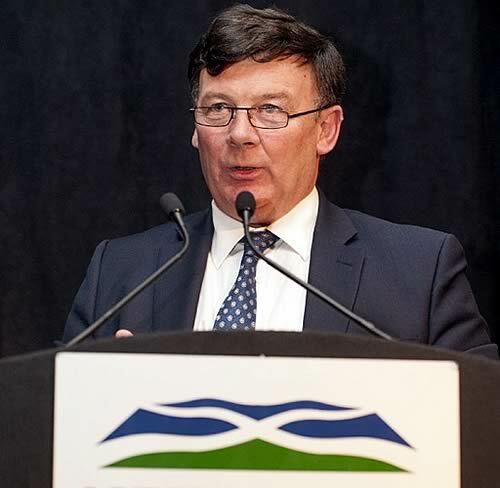 Mr Bowie takes over one of the top jobs in Scottish agriculture from Borders farmer Nigel Miller, who steps down having served for four years. In the vote, taken at the Union’s AGM in St Andrews on Tuesday 10th Febraury, Allan Bowie secured the Presidential spot, against fellow contestants Andrew Moir and Rob Livesey. Mr Livesey, from the Borders, and Dumfriesshire farmer Andrew McCornick were successfully elected as Vice Presidents of the Union. The unsuccessful Vice Presidential candidates were Andrew Moir from Kincardineshire; Kelvin Pate from Lothian & Borders and John Smith from Kintyre. “I am very pleased to be elected into the post of President. It will be a huge task to follow Nigel Miller, but also a huge privilege. I appreciate all the support from the council and members, and going forward it is certainly going to remain challenging. “I look forward to representing members on all sectors and scales. In his final address to council, Nigel eluded to the unfinished business that we have around CAP implementation, land and tenancy reform and new powers for Scotland. The work that Nigel has so ably started, means that I, and the new Vice Presidents, will need to hit the ground running. “I want to thank sincerely my fellow candidates for their company and the last few weeks of hustings have been a whirlwind. It was a privilege and pleasure to tour the country with them, speaking to members across all our regions. This is one aspect that we’ve always got to concentrate on – continuing to listen and speak to members. Allan is married with two sons and a daughter. He farms in North East Fife and Clackmannanshire with Christine and son Callum, majoring on growing cereals. The area farmed extends to about 850 acres on contract farming agreements. In addition, the business grazes a number of suckled calves. He was chairman of the North East Fife branch and served two years as chairman for East Central region. Allan has been Vice President since February 2009. Rob is married with two sons. He farms Firth Farm near Lilliesleaf in the Scottish Borders with 1,100 mules ewes, 80 Salers cows and 125 acres of cereals. The Firth is a tenanted farm of 600 acres and a further 200 acres is rented nearby. Rob has been a Vice President for the last two years, and was Livestock Committee Chairman for four years before that. He is also a past President of the Selkirk branch. Prior to taking the tenancy of the Firth, Rob managed a large estate in south Ayrshire for seven years after leaving the family farm at Bonchester Bridge. Andrew, who is married with three sons and a daughter, was born and brought up on a dairy farm in Wigtown. Andrew and wife Janice farm their 230+ ha unit with 160 suckler cows and 600 breeding ewes with a small herd of pedigree Charolais cattle. For as long as Andrew can remember, he has been a member of the Union, and got more involved when the consultation for Nithsdale NVZ came out. From there he went onto become vice chairman of the Dumfries branch, and then onto his current role of Regional Board Chairman for Dumfries and Galloway. He also sits on the LFASS committee.